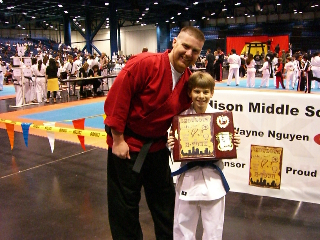 In March 2009, Lorenzo Casso participated in a large national Karate tournament in Houston, Texas. The tournament was sponsored by Chuck Norris's Kickstart program. Chuck Norris was actually present for the finals on Saturday night, when Lorenzo won 1st place in his division for Traditional Forms! What awesome news! Keep us posted Lorenzo.